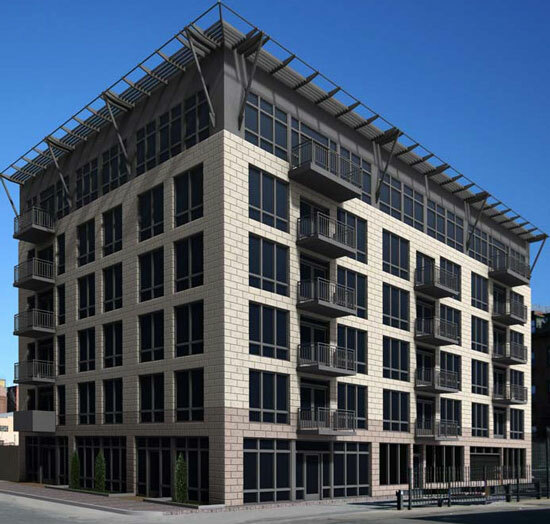 Scope: New construction of 25 contemporary one and two bedroom loft spaces, 6 story steel framed building + penthouse. The total building area is 36,000 sq. ft. The garage had tandem lifts parking spaces on the 1st Floor. “Each job has its challenges. This one had several. First, we had a tight budget and worked extensively in meetings with the developer and architect to get it right. It was a major achievement to hold the budget throughout construction, even as the scope was revised to meet marketing needs. The site itself was cramped and complicated. Concrete caissons and grade beams with a structural slab were needed to support the six story steel structure in soil conditions that are typical in Boston’s South End. The main street was a maze of utilities that required rerouting of the main utility lines from the building, which is what you sometimes are faced with in Boston. Being surrounded by streets on three sides, with the remaining side occupied by a used car lot, added to the challenge. Keeping pedestrians safe required detailed scheduling of all steel erection, concrete placement and exterior envelope construction.